eoTablet Order Entry with explanations. eoTablet Order Entry menu explanation. 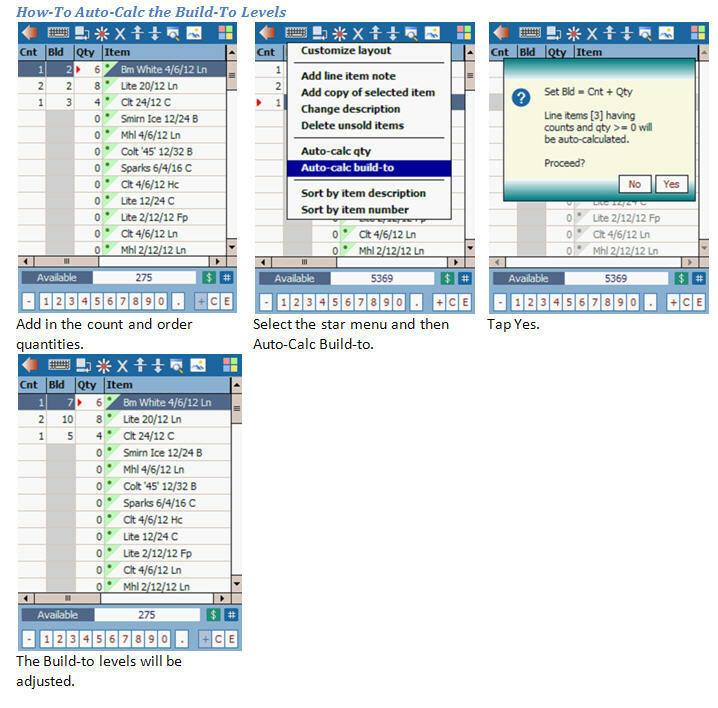 The Order Entry option on EoTablet is used similarly to the order entry screens on both eoMobile and in the backend system. Here, it is possible to make a pre-sell order for the selected customer. This order is sent to the Order Tracker after a full sync. In March 2010, changes were made so that it was possible to show retail UPC codes in a column. Changes were also made to highlight both Adds and Cuts in recent orders. It is possible to Hold an order by taping the command button Hold on the menu bar. This ability, will not remove zero-quantity items on the invoice; but instead leave these items so that the user may return to the invoice and complete it at a later time. Held orders will show a red "On Hold" on the customer list, which can be tapped to re-open the order. It is also possible to reopen a held order by selecting the customer and tapping Pre-sell. The order may also be re-opened through the recap screen. The user may perform the upload-only operation even if there are orders on hold. In July 2010, changes were made so that eoTablet could sort lines on an invoice. To sort the items on an invoice, click on either the Description or Prod # grid headers. Note lines stay below the item they were below before sorting, and a note line at the top of an invoice stays there when sorted. In June 2012, changes were made allowing a scanner to be used for product entry. From eoTablet's main screen, tap Run Route. 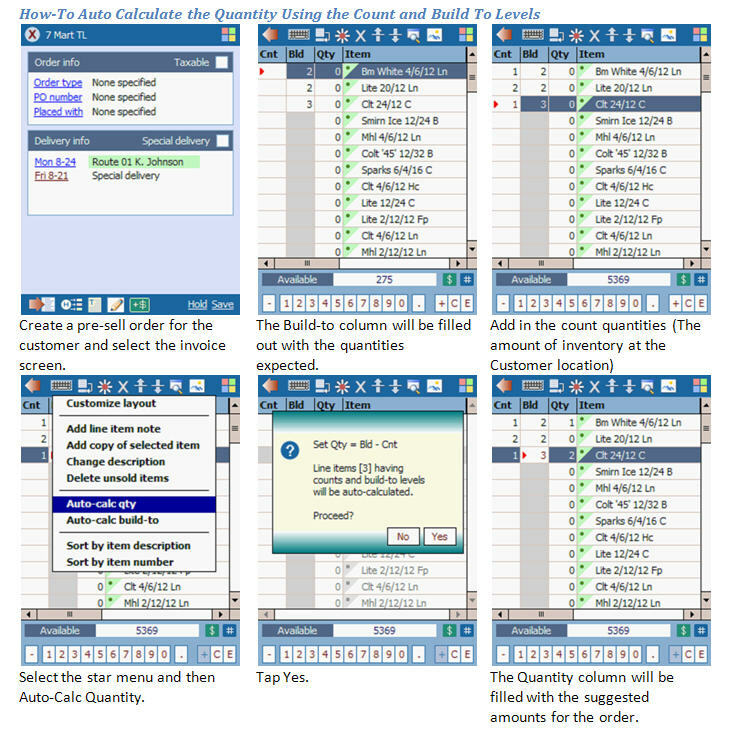 Add products to the order by taping Find & Add Products. Add the amount of product sold. Add a delivery charge, by taping Delivery Charge. To change the pack size of a product to an alt-pack, tap Change Pack. 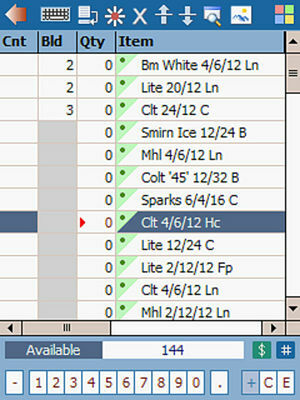 Used the drop down arrow at the bottom of the screen to toggle between available information on the order or about the customer. When finished making changes to the order, tap Save. 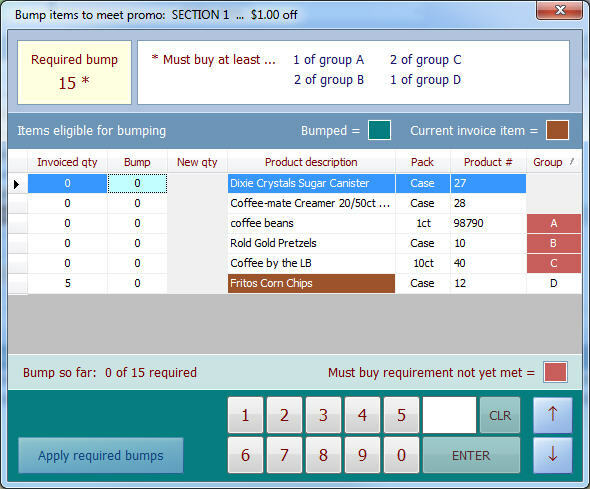 With the addition of the AutoBump Plugin, users may "bump" the quantity of product(s) in a promotion to meet the minimum threshold for receiving the discount. If the promotion has mix & match enabled, multiple items may be bumped in order to reach the promotion's requirements. Select a customer and tap Pre-sell'. The description is highlighted for product(s) with a promotion available. Change the bottom section to show Available Promotions. Tap +X More to open the Bump screen. The total Required Bump quantity is displayed in the upper-left. If there are additional Must Buy groups, they will be listed along with the minimum quantity for each group. This button will be disabled until all promotion requirements have been met. 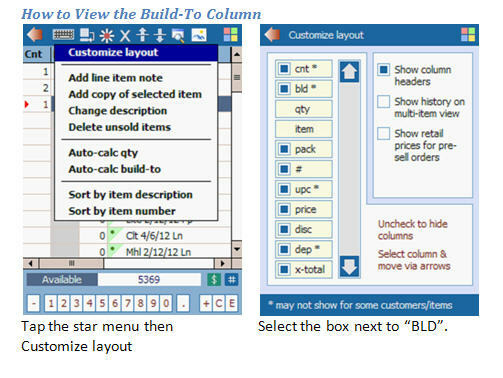 The review pre-sells option on eoTablet is used to review and make edits to already created orders. These orders have not yet been uploaded into the backend system. The radio buttons at the bottom of the screen allow for the user to toggle between information. From eoTablet's main screen, tap Review Pre-Sells. Select the order from the list and tap Re-Open Selected Order.